When the subject of dangerous predators comes up, owls probably aren't the first animals that come to mind. 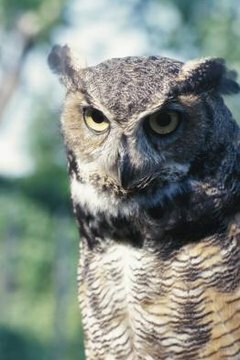 Despite that, some species of owls are ferocious hunters in their own right, such as the great horned owl (Bubo virginianus), which the Blandford Nature Center names as the deadliest owl of all. Great horned owls live all other North, South and Central America, in nations including Brazil, Costa Rica, Argentina, Colombia, El Salvador, Nicaragua, the United States, Bolivia, Mexico and Canada. These adaptable birds can manage in a wide array of living environments, such as deserts, grasslands, canyons, agricultural sites, outer portions of forests and near cliffs. It also isn't uncommon to spot great horned owls in city settings with lots of people. Great horned owls are seriously deadly predators, and their diets consist mostly of meat. They prefer eating smaller mammals, with diverse dietary staples that include skunks, raccoons, mice, porcupines, squirrels, woodchucks, domestic cats, voles and young rabbits. Great horned owls also often consume fellow birds -- mostly waterfowl, ducks, hawks, falcons, quail and Canada geese. Bugs also make up some of their basic diet, especially in desert settings. They also dine on amphibians, reptiles and fish. Since they are opportunistic feeders, they aren't choosy at all about what they eat. These night hunters attack their prey from the top, according to the National Geographic. Their sharp talons do the work, even when it comes to animals that can overwhelm them in sheer size. Although most of their hunting takes place at night, they occasionally hunt in daylight. As for smaller scores, great horned owls swallow them intact. For bigger prey, they tear them into more manageable fragments. Great horned owls are formidable creatures that don't really have any predators of their own, according to the Animal Diversity Web of the University of Michigan. Occasionally raccoons and crows consume great horned owl eggs, however. When great horned owls get into territory-fueled scuffles amongst themselves or with snowy owls or eagles, it also can bring on deadly results, notes the North Carolina Wildlife Resources Commission.